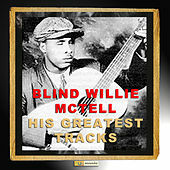 Although Blind Willie McTell went by a handful of other aliases, his singing and prodigious guitar playing are unmistakable staples of the blues. From the 1920s to the late 1950s, his songs offered excellent insight into the man who invented his own style of guitar playing. McTell could read music as well as write it in Braille, and from listening to his songs, it's evident his twelve-string improvisations were not only brilliant, but revolutionary. In the studio, McTell almost always played the twelve-string acoustic guitar. Unlike many of his contemporaries who utilized resonators and dobros, McTell leaned on his instrument's ability to sound like two guitars by picking and sliding all over the neck. His early recordings were hypnotic narratives full of exquisite guitar lines and extraordinary vocal performances that set a powerful and moody backdrop for his stories. The man's style effortlessly traversed from knee-slapping Ragtime to more dissonant and spacious Acoustic Blues. 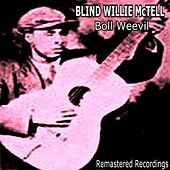 McTell died in 1959 of a brain hemorrhage.